Endurance Vehicle Protection, one of the nation’s largest vehicle service contract providers, commonly referred to as extended auto warranties, is proud to sponsor GiveMeTap’s clean water project for World Water Day. “GiveMeTap’s project is life-changing and Endurance is proud to be a part of it. We encourage others to help the communities in Ghana and join us in sponsoring this important initiative. To celebrate World Water Day, Endurance is helping sponsor GiveMeTap's Clean Water Protect, which gives citizens access to clean drinking water in areas with underdeveloped water systems. This crucial effort from GiveMeTap, with help from supporters like Endurance, seeks to hydrate the world and give every living person on the planet access to safe drinking water. And with over 780 million people without access to a viable source of clean water, every single bottle counts. A simple process with a revolutionary outcome, by simply purchasing a GiveMeTap water bottle from the for-purpose company helps give another person in Africa access to clean drinking through the development of sustainable water projects. As an added bonus, every GiveMeTap water bottle holder receives complimentary water refills at over 500 participating cafes and shops. From every bottle purchase, GiveMeTap creates clean, safe drinking water in communities across Africa by building water boreholes and pumps that can supply entire villages with clarified drinking water. GiveMeTap has transformed thousands of lives through their clean water initiatives and look to spread their message even further to the countless people in areas where access to livable drinking water is nonexistent. Everyone participating in the project can forever change the lives of people living in a community in Ghana. 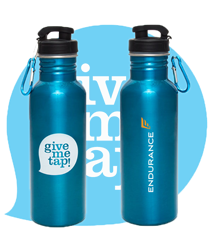 In addition to providing clean drinking water to those in need, Endurance used the sponsorship of GiveMeTap to encourage employees to utilize these refillable water bottles. By supplying each employee with these reusable bottles, Endurance overall can create less waste and plans to use the money saved to purchase more GiveMeTap bottles in the future. With the support of Endurance and other contributing individuals, GiveMeTap will be able to fully fund this clean water project for a community in the Upper West Region of Ghana, called Wa. The water pump will provide clean fresh water to around 800-people for the first time ever.